The Past Presidents Parley is a forum that brings together the experience of our former presidents and utilizes their expertise in active service to the American Legion Auxiliary. Women who have been president of a unit, department, or the national organization are encouraged to contribute to the Auxiliary as members of the Past Presidents Parley. These leaders share their wisdom and provide ongoing mentorship to empower and bolster the Auxiliary’s present leaders, ensuring the continuity and strength of the organization at all levels. The Unit Member of the Year award recognizes women serving at the unit level who exemplify the values and ideals of the Auxiliary and whose accomplishments significantly impact the program work in their units. Nominees must be an adult American Legion Auxiliary unit member not in an elected or appointed leadership role higher than unit president. A narrative of 1,000 words or less describing the nominee’s accomplishments and activities must be submitted by a unit to its department’s Past Presidents Parley chairman. Each department selects one Unit Member of the Year from its submitted candidates. The selection of the winner is at the discretion of the department Past Presidents Parley chairman. Established in 2003 by the Past Presidents Parley Committee, this award has evolved from honoring women veterans to honoring women who are actively serving our country. Recipients are guests at the Auxiliary’s national convention where the awards are presented. Award winners who are not already Auxiliary members may be presented a one-year honorary membership in the Auxiliary department of her choice. Established in 2003, the Salute to Servicewomen Award has evolved from honoring women veterans to honoring women who are currently serving our country in the U.S. Army, Navy, Marine Corps, Air Force, and Coast Guard – including the National Guard and Reserve components of each branch. One servicewoman from each branch of service will be recognized at the American Legion Auxiliary National Convention. Recipients attend the National Convention as guests of the Auxiliary. A woman currently serving in the U.S. Armed Forces (includes National Guard/Reserve). A written narrative or YouTube video that demonstrates exemplary service both in and out of uniform, making her the face of women in the military. 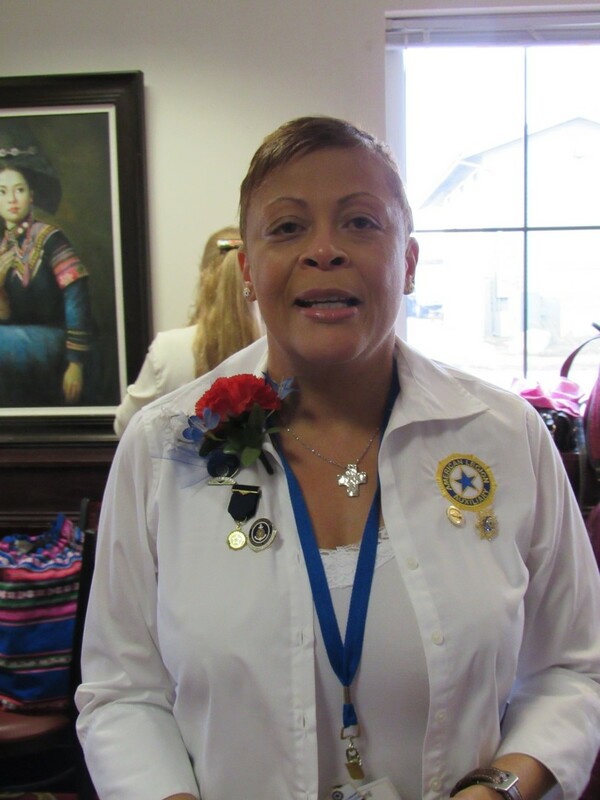 Servicewoman must be willing to be a guest of the Auxiliary and speak to the general assembly of the American Legion Auxiliary National Convention. All nomination forms must be submitted by April 25, 2019. The nominating person or the servicewoman writes a narrative (750 words or less) or creates a YouTube video (3 minutes or less) that shows the nominated servicewoman demonstrating exemplary service both in and out of uniform, making her the face of women in the military. The following form must be completed and submitted by April 25, 2019, to National Chairman Jan Pulvermacher-Ryan. Written narratives should be attached. YouTube video links should be pasted in the box provided on the following form. is not set to "private;" your video must be public. I will choose a panel of Past Department President to judge the entries. The luncheon will be held at the same venue as the convention so no travel will be involved. The cost for the catered luncheon will be $15.00 per person. Please let our Secretary Barb Nath know how many from you Unit are planning to attend so that we can give the cater a ball park figure on how much food to supply. You will pay for the luncheon at the Convention. I would like to remind each Unit that we do bring exchange item to give to each member in attendance, this is always a fun exchange. For a fundraiser this (for future development of our Department) I would like you to bring a bag with a pound of something, any thing you would like. The bag can be anything from a brown lunch bag, new or used purse or any kind of non-see through bag. The bags will be auctioned off during the lunch. This should be a fun event. I am looking forward to seeing you all at the Department Convention. Safe travels to all.